Pumpkins are favorites of gardeners all over the world — literally! You’ll find them growing on every continent exceptAntarctica, their bright orange exteriors, an unmistakable sign of fall. From tiny miniatures to the giants of the field, there’s nothing more satisfying than harvesting your own crop of pumpkins! Here’s how you can bring a splash of color to your garden this fall. Pumpkin pie types (Cucurbita Moshata, which also includes other squash varieties) are smaller and sweeter than their cousins, the jack-o-lanterns. These are great for cooking but slightly more difficult to carve due to their small size and thick flesh. Carving pumpkins (Cucurbita Pepo) are the so-called jack-o-lanterns of the pumpkin patch. You can choose seeds that result in perfectly even, round pumpkins or opt instead for a variety that produces an interesting variety of ovals, spheres, knobby textures, and plenty of other fodder for creative carving. Giant pumpkins (Cucurbita Maxima) are the variety from which those show-stopping prize winners are grown. Carefully tended, these pumpkins regularly grow to 600 pounds or more, with the world record nearing 1500 pounds for a single one of these monsters. The traditional pumpkin patch takes up quite a bit of space, so gardeners with less room to grow will be happy to know that some varieties of pumpkins can even be grown in containers! Consult the seed packet to determine how much space you’ll need in the garden, as this varies quite a bit from one variety to the next. Pumpkins require moist soil. Standing water will quickly rot the plant or the pumpkin itself, so proper drainage is just as important as good moisture. These fast-growing, hungry vines need a steady flow of nutrients. Start with rich, organic soil and be prepared to fertilize frequently. Pumpkins thrive in full sunlight, so for the best possible crop, pick a sunny location for your pumpkin patch. Ideally, do not plant pumpkins where they were planted the year before. If you must use the same spot, use extra care when fertilizing. They can really sap the soil of nutrients, leaving little for the next year’s crop. It is beneficial to begin the soil amendment process well before planting time. If that’s not possible, make sure that any compost or manure that you add to your soil has had time to properly decompose. Immature compost can harm or kill your plant. After adding organic materials (compost, manure, peat, etc), turn the ground over several times so that it mixes in well. If your soil is sandy, add topsoil. 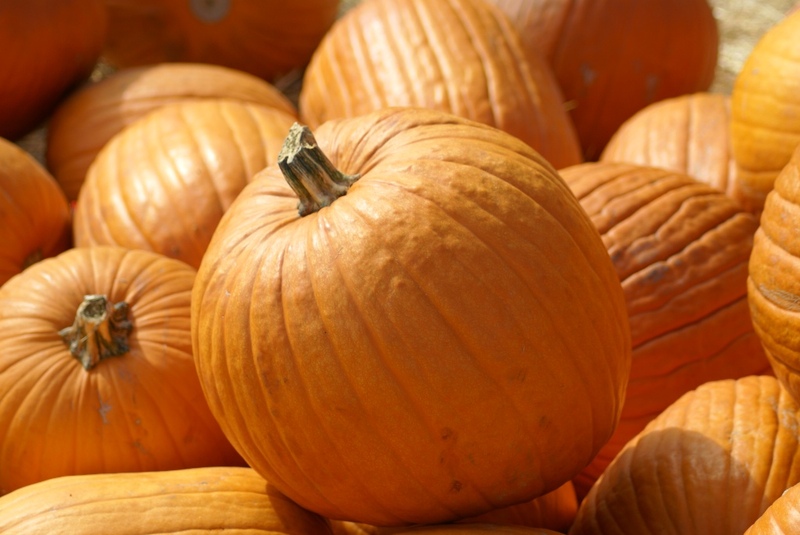 Your site needs to be able to retain moisture for your pumpkins to grow well. For heavy clay soil, you may need to add some sand. Before planting, apply a nitrogen-rich fertilizer. Keep the area free from weeds, which compete for nutrients. Most pumpkin growers plant pumpkins on small mounds, or hills. This protects the tender young vines from an excess of water from heavy spring or torrential summer rains, and also allows for better heating of the soil. The precise planting time will vary for your area, but it can easily be found on the seed pack. Pumpkin maturity time depends on the variety of pumpkin and your climate conditions. Most range from 90-160 days. In general, you’ll want to sow 3-5 seeds per mound. Follow the directions on your seed pack for your specific variety of pumpkin. Adhere to the directions for the spacing between mounds. It may look like a lot of empty space, but voracious pumpkins can grow at an astounding rate of 6” per day or more and that space will soon be lost in a tangle of vines and leaves. Cover with the recommended amount of dirt and pat the mound firmly. Water and fertilize the newly planted seeds. After 2-3 days, water again if there has not been rain. The object is to keep the soil moist without drowning the seeds. When pumpkins sprout, thin to the one or two healthiest seedlings. The stronger seedlings will be taller, thicker, and will have more leaves than their counterparts. Water pumpkin plants in the morning and at the base of the plant. Darkness and moisture on the leaves may lead to mildew. Fertilize every two weeks, following the directions on the fertilizer. When pumpkins are bright orange (assuming they are an orange variety) they are ready to pick. Cut the stem carefully, and never pick pumpkins up by the stem, as it may not be able to support the weight of the pumpkin. There are a few good varieties of mammoth pumpkins available, but if you’re going for a world record, the Atlantic Giant has been the only variety to hold the title since 1979. When you prepare the soil, adjust for a pH between 6.5 and 6.8. Garden centers have pH test kits. Sulfur lowers pH, while lime raises it. Start seeds indoors to get a head start on the growing season. Protect seedlings from wind and frost. Build a temporary shelter around the plant and cover with clear plastic sheeting. Take extra care to keep the soil moist – rain may not be able to reach your plant under protection, and the warmer soil will dry out more quickly. Hand pollinate the flowers. Female flowers will have tiny pumpkins attached. Locate a male flower (sans pumpkin) and gently peel the petals back, touching the center pieces to those of the female flower. If the vine has more than one pumpkin, choose the largest and healthiest and cull the others. Once pumpkins are established, fertilize plants with 20-20-20 as often as directed. These simple steps will help your pumpkin crop along. If your desire is quality, not quantity, remove all but one or two pumpkins from each vine. This allows the plant to provide optimum nutrients and care to these fruits. To keep your patch from become unruly, use pruning shears to trim each vine at a distance of 10-12’ past the end of the pumpkin. Water regularly at the base of the plant, keeping the soil moist. Fertilize with 20-20-20 as directed on the container. Pick pumpkins when they mature so that the plant can continue produce more fruit. If you have a short growing season, you can start pumpkins indoors. A seed starter kit will come with full instructions explaining how to successfully start your pumpkins. Plant miniature pumpkins in containers if you don’t have much room. You’ll have to be particularly careful to keep them well fertilized. Pumpkin vines set down secondary roots, so if possible, amend or fertilize the soil under the vines as they grow. Because pumpkins set down roots as they grow, it’s best not to move a wayward vine. If it ventures into your yard, simply steer the mower around it until the end of the season. Pumpkins don’t have to be orange! Yellow and even ghostly white varieties are popular and just as easy to grow.